Our 5 year existence, what a year!! 2018 was filled with huge peaks and lows. Festivities each quarter, celebrating our jubileum, Xomnia Fest, our first very own mini festival, and a team weekend in Euro Disney as cherries on the pie. In the summer we launched Shipping Technology, a spin-off company of our self driving boat initiative aimed at innovating the inland shipping sector. A dedicated team of Xomnia develops the solutions. Our partner in this initiative covers the markets. A new start-up, exciting :). The rest of Xomnia’s client portfolio and the data science market in general grew so fast leading to such a strong demand that a waiting list arose. A challenge that proved difficult to solve and that would continue to last in 2019. Not the least because we experienced a very turbulent period with our team. Several very appreciated team members moved on to make their next career step. Saying goodbye is never easy, good luck guys! Gratefully also a lot of awesome and skilled people joined us. The team proved to be very resilient in the demanding times that 2018 brought us. Heartwarming! Xomnia is reaching its limits in office space again. Luckily we are able to open two extra floors at our HQ during ’16/ ’17 NYE. We celebrate ’16 as the year of Xomnia’s breakthrough and can’t wait to continue the rollercoaster that Xomnia became. People often say that breaking the 50 team size barrier comes with challenges. In our case it appears to be true. We experience the need to focus more heavily on our internal organization whilst beforehand being used to invest almost all our time on the market. We for the first time truly overthink and optimize our processes and define our longer term strategy. Systems are being put in place to track business development, market exposure, team performance, etc. We also discover that Xomnia and its clients start needing some kind of a CRM system for all big data activities itself. A platform that provides an overview on top of these activities regardless the technologies being used. One in which people can collaborate, understand an track eachother progress. One with a fast road to deployment, and one in which knowledge becomes ownership of the team, instead of that of an individual. We find our ideal partner in Sillicon Valley based Domino Data Lab, start using their solution, and become its first reseller in the world! Xomnia’s choice to besides projects and consultancy focus on sharing knowledge in big data training programs starts to pay-off. Our client base is rapidly expanding. This is being accelarated by the launch of our traineeship formula. With this new service we support organizations in helping them to find and guide young data scientists and big data engineers. A challenging task for most organizations but less for Xomnia thanks to its gained big data experience and network. 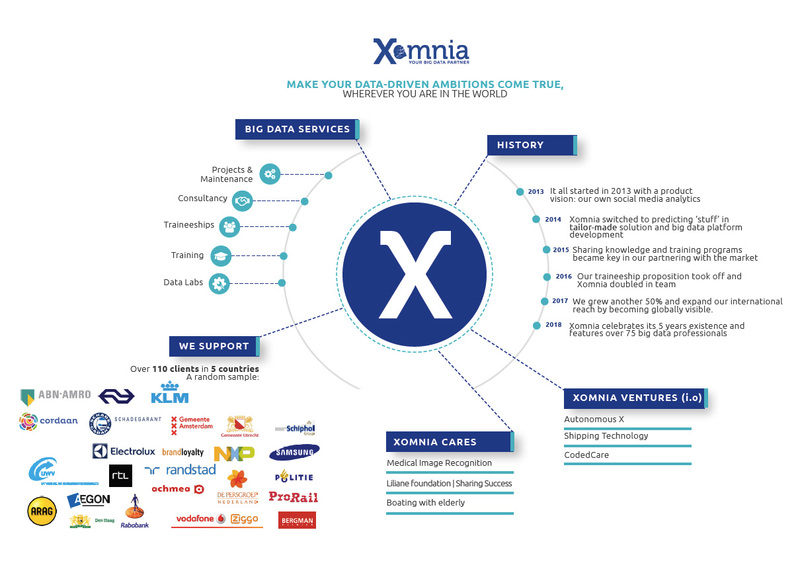 Xomnia heavily invests in extra senior data science and big data engineering capacity to set a solid fundament for all its services. Having a fast growing team requires additional office space but our location doesn’t meet these needs. We decide to open a training location around the corner, at the Prinsengracht. We faced another capacity challenge though. Our student time steel vlet on which we loved to drink a beer with the team while boating the canals only fit 8 people. After quite some discussion on whether it would be smart to invest in a bigger one, we decided to buy a big old lifeboat, painted it blue and put our name on it. This boat would soon become one of our trademarks. As big data capabilities are slowely becoming a strategic asset at our clients we notice the importance of sharing our big data knowledge. Starting in project handovers but soon to be followed by providing big data training programs. Another effictive way is found in sharing Xomnia’s core team on subcontracting conditions with our clients. We launch a partnership with RapidMiner, one of the leading global advanced analytics platforms which fuels us with new market opportunities. 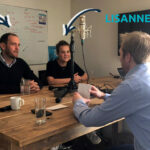 A knowledge sharing initiative BigDataGemeenten with the goal to support municipalities in becoming data driven goes live. This would become a respected platform with who we reach most municipalities in Holland by now. And lost not but lease, we serve our first client in Belgium! Xomnia is enjoying its cosy office, 60 m2 next to Leidseplein. To be doubled at the end of the year. Meanwhile it fails to bring its proposed product to the market. As we notice an increase in organizations asking for tailor-made big data projects we decide to follow their needs and drop our own product. A difficult decision but one that seems to pay-off today. Predicting stuff becomes our core focus. Thanks to our experience with analyzing social media data Xomnia also scores its first text mining projects. We start to cooperate with giants like TUI and Randstad. Xomnia is proud that they still trust on our services today! Another milestone, Xomnia won its first price. 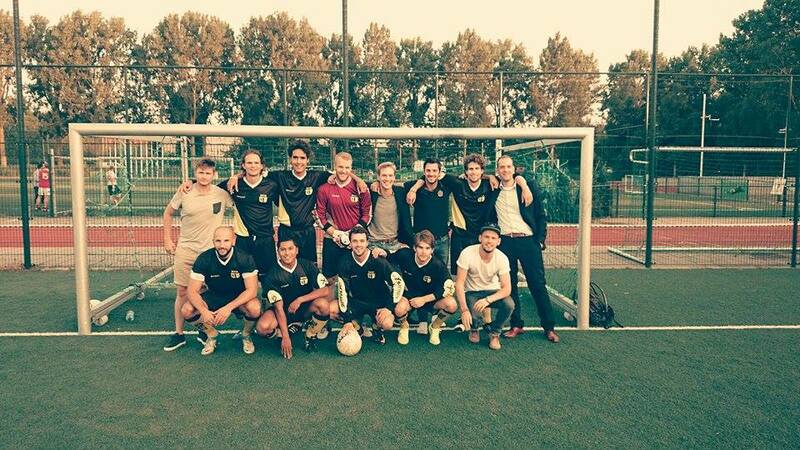 A summer evening soccer competition, not so much related to its business though..
Xomnia was launched early 2013 as a solution provider. 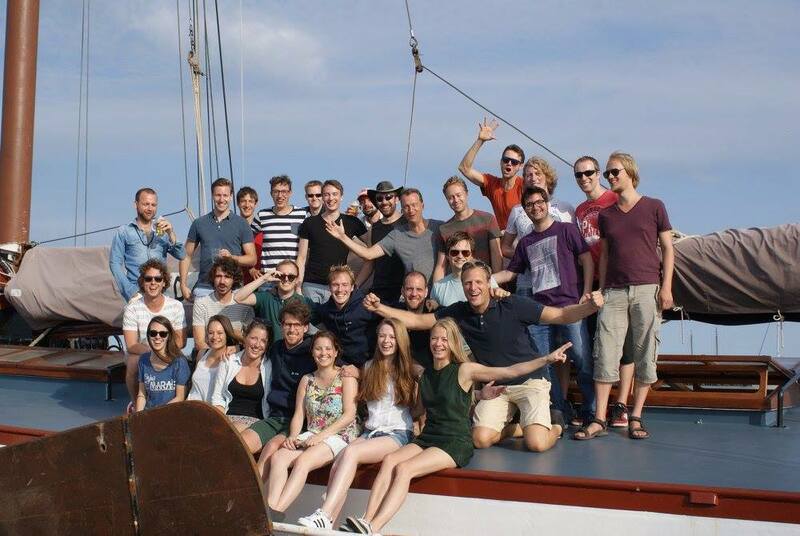 We hired our first Data Scientist and a Big Data Engineer and took off with a team of 5. Our focus was all on developing a cool product that enabled organizations to bring external (e.g. 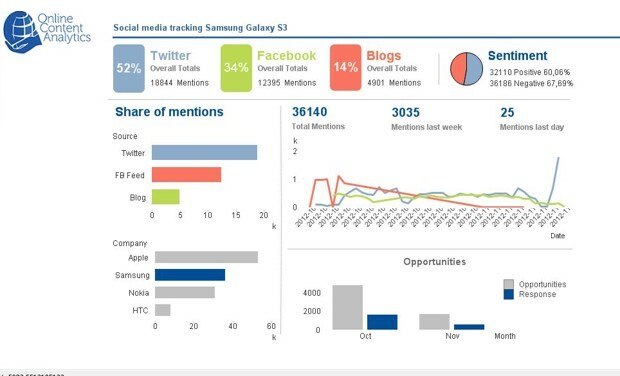 social media) and internal data sources together to retrieve actionable insights (e.g. leads) from it. Cheaptickets.nl and Samsung became our launching customers. ‘Unfortunately’ both had tailored needs beyond our product vision. We still gratefully took the work to ensure our first client references and a little cashflow. 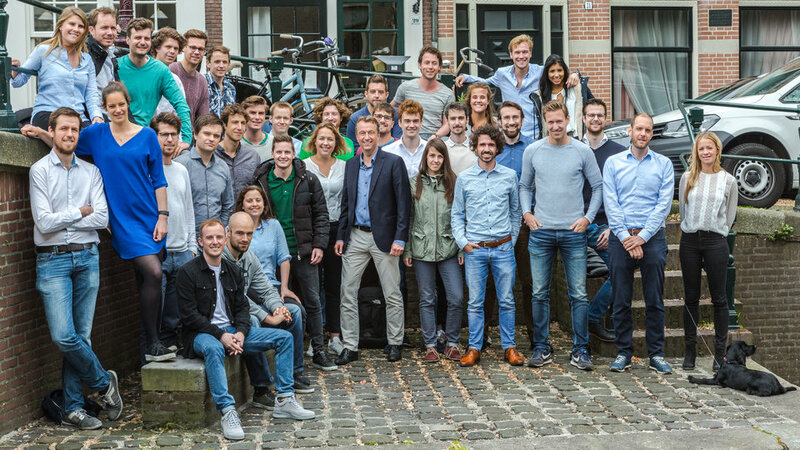 The actionable insight for Cheaptickets.nl in the field of product recommendation would become our first predictive model development!